Do you know the most functional food in the world? Or you might have thought nothing of that sort ever existed. If there is one product that encases all nutritional benefits needed for the human body, it has to be Surthrival Colostrum. Like any other best supplement for optimal health, this one also doesn’t get spared from all the hype around the globe. However, let’s dive into the features which make it popular and see whether it’s worth all the hype happening around. 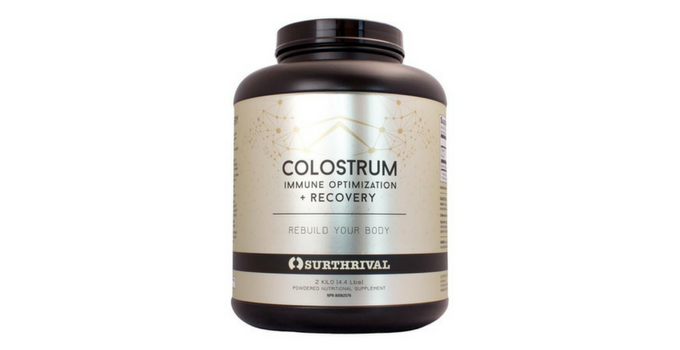 You might be familiar with colostrum as a useful supplement that supports immune system functioning and assisting your body’s natural renewal process. But I’m unsure how many people know about its magical digestive properties and ability to heal a leaky gut. Colostrum often called as immune milk is the first meal of all mammals. We all know how precious the first milk is as it has all the goodness of immune antibodies and growth factors to support your overall development. It is through colostrum that mothers pass immunity power to their offspring. Growth factors contained in colostrum that helps in stimulating the development of a new born’s digestive system for improved nutrient absorption and prevention of various food allergies. By now, you might have a good idea about colostrum and let's get deep into Surthrival Colostrum. Surthrival Colostrum is one of my favorite brands offering colostrum supplement packets with nutrients and immunity boosters. It is a product made from cow’s milk produced by cows to nourish their newborn after birth. The next obvious question which comes to your mind will be, how can this benefit humans? The truth is that Surthrival Colostrum derived from Bovine colostrum is a super food packed with rich nourishment that is proven beneficial to humans in several ways. It is the complete food containing essential amino acids, fats (fatty acids), glyconutrients, immune transfer factors, and antibodies. The immune milk comes with metabolic factors like minerals, vitamins, lectin, enzymes and much more. Supercharged with over 97 immune factors, the Surthrival Colostrum supports a balanced internal environment promoting digestive health. Surthrival only sells superfoods which are proven to support powerfully and rejuvenates the body functions of human beings. They select their products with utmost care so the end product will always be a competitive one. IS it more effective than a flu vaccine? It has proved that bovine colostrum is 3 times more effective in preventing flue through strengthening the immune system. Yes, it is more effective than a flu vaccine. 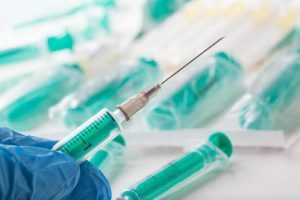 Especially with the controversies surrounding the chemicals contained in flu vaccines, Surthrival Colostrum might be a better alternative. 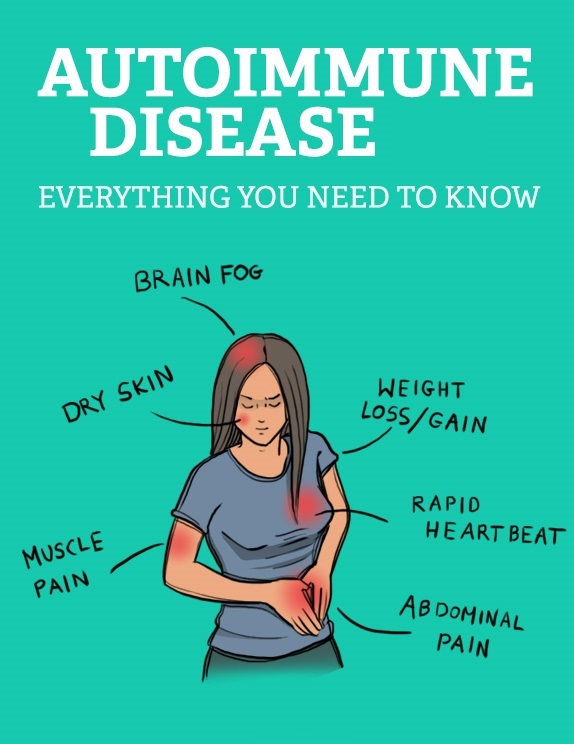 For everyone who suffers from autoimmune diseases like IBS, asthma, psoriasis, arthritis and disabilities, Surthrival Colostrum works well due to its immune modulating benefits. 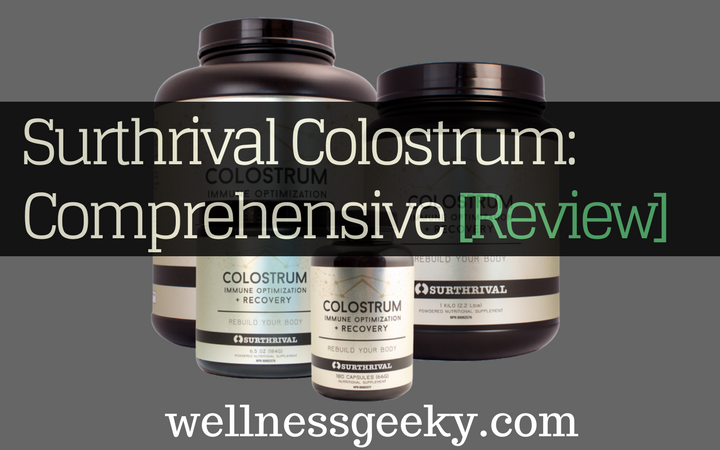 What makes Surthrival Colostrum special? Before choosing to have a product that has taken from cow’s milk, the last thing you don’t want to do is to degrade the health of calves. However, Surthrival Colostrum capsule is one product that is created by a brand that cares for every living creature in the world. The brand follows the ethical practice of extracting the colostrum from cow’s milk only after calves gets their portion of nutrients. It is one of the most appreciable differences that make Surthrival unique. Surthrival Colostrum is not yet another colostrum harvested from cow’s milk without paying attention to vital factors. The colostrum from the well-renowned brand keeps up the time of 6 hours to harvest colostrum from the milk. When hours pass by, what we get is not colostrum, it becomes transitional milk. The colostrum extracted this way is much high in protein levels, and polypeptides are having excellent benefits for your health. The whole procedure undergoes strict monitoring and verified by a third-party to ensure its authenticity. I haven’t heard of any other product in this world claiming quick recovery time. When similar supplements take their own good time to show results, survival takes the shortest time to cure and health conditions due to its immensely rich nutritional factors. The product is even capable of treating conditions like autoimmune disease and even Alzheimer’s. Usually, all enriched supplements will be dull and utterly tasteless. However, Surthrival Colostrum is exceptionally creamy and yummy and gives you the convenience of having either in the form of smoothies or shakes. Not only you can make it into liquid form; you can add it to another foodstuff as well. What not, it can be used as an excellent skin mask too. I assume that you have ended up after thorough research on colostrum supplements and have gone through many brands offering the ultimate health supplement. So let’s get directly into the topic, why you need to choose Surthrival Colostrum powder over all the over choices out there. The primary reason has to be the process by which it has made. If you have read through, you might know how the ethical practices by which it has made affects its quality. Making sure that colostrum is harvested quickly and calves are fully nourished ensures a high-quality product. It is interesting to note that colostrum powder doesn’t possess any significant drawbacks. The only disadvantage is that it has extracted from a cow, but it is justified that the brand pays a lot of attention in not identifying anything meant for calves. Is there any other colostrum product beating the quality of Surthrival? There are very few companies that sell raw 6-hour colostrum without compromising quality. All products claim to use the same technologies for preparing the colostrum, and the following are the three best-selling colostrum available in the market. Immune Tree sells the same product as that of Surthrival; with their brand name on the package. 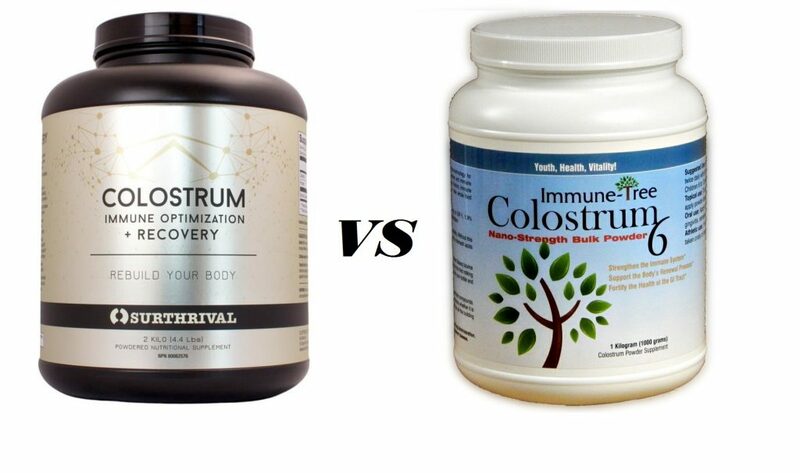 When we make a comparison with Surthrival Colostrum vs. Immune Tree Colostrum 6Power, the Immune Tree also focuses on quality of brand marketing, and that is why they stand very close to Surthrival Colostrum. However, if you ask me which one to go for, then my recommendation will be Surthrival, and they suit me best when I want to buy colostrum in bulk. Symbiotics Colostrum Plus Powder is another colostrum available in the market featuring natural immune factors and immunoglobulin for modulating your body's immune response. The manufacture's claim to source the colostrum from the first milking of cows and has checked in labs for pesticides. 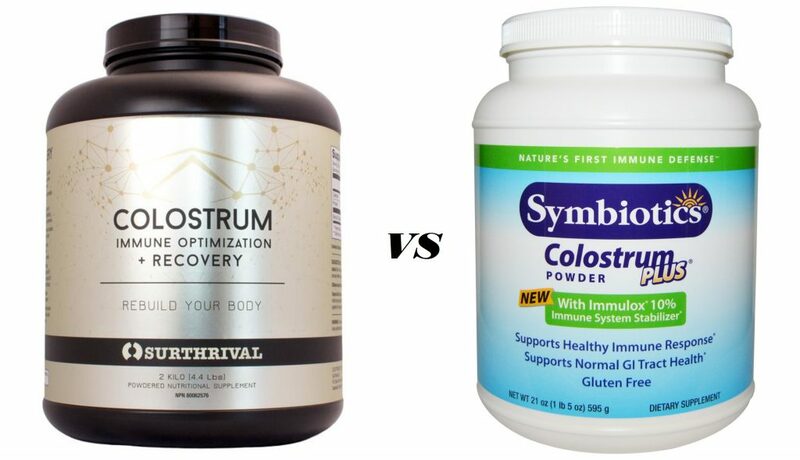 However, when comparing Symbiotics Colostrum Plus Powder vs. Surthrival Colostrum, Symbiotics one seems to lack the 6-hour time frame which is vital. Body Boost Colostrum Bovine powder is 100% pure whole protein supplement. The product being marketing with a 100% money back guarantee and offers maximum biological activities. 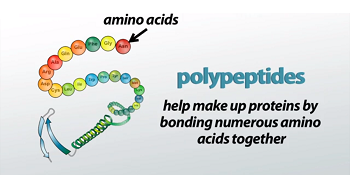 Comparison establishes the close similarities of many ingredients, antibodies, immune factors and anti-aging properties, which has immense ability to repair DNA and RNA, etc. 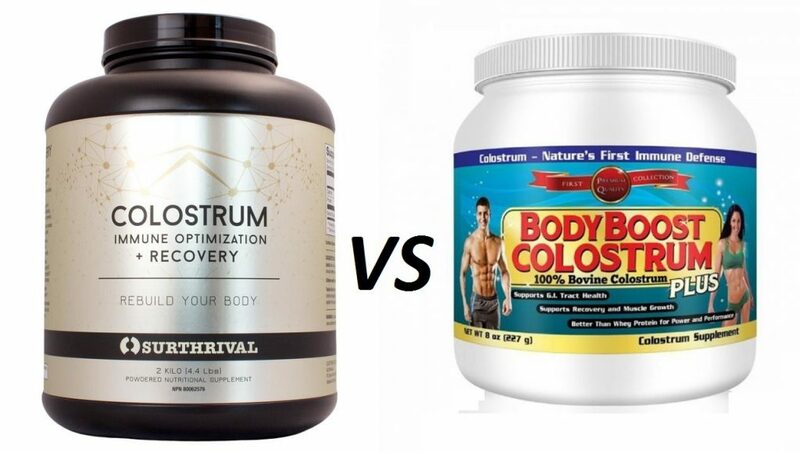 It is indeed a strong competitor for Surthrival Colostrum, but like many other products, Body Boost Colostrum Bovine Powder has no FDA approval, which cast a shadow on the product when looking for authentic information. The most important thing with colostrum products is that it has to prepare raw and uncooked to retain full benefits. 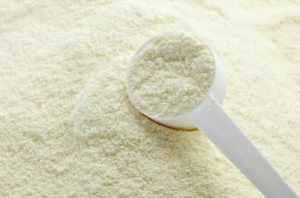 Once the colostrum is heat treated, it loses the growth factors and antibodies and finally what you are buying will be highly expensive protein powder. Due to these reasons, Surthrival Colostrum is one of the top colostrum supplements for your healthy immune system and tissue regeneration. Surthrival Colostrum is a type of supplement where you can personalize your recommended dosage depending on your condition. However, as with any other supplements, it is better to check with your doctor for professional advice before straight away going for it. Another way is to start off small and gradually increase the dose. With that said, ingesting two tablespoons per day is okay. Once you see it working wonders for you, you can continue with the intake.